Never did I anticipate that Spike and Bridget would adapt so well to living in the desert. What a great crew I have! We hike way down the dirt road, up a rocky embankment, across a wash, up another rocky slope, until we reach a ridge which we follow for quite a bit. All along the way there are potential wounds to their pads: sharp rocks, cholla needles, broken glass, rusty cans, and prickly plants with menacing thorns. The crew traverses the terrain like seasoned explorers, carefully placing their paws with every step. The Sonoran Desert is fascinating. The air is dry and fresh. I discover new plants every day, some with tiny buds or flowers. The changing light transforms all it touches. I let the crew decide where we will go. Spike stops us periodically and does a nose test. Bridget and I wait patiently as he turns his head, holds it steady, wiggles his nose, turns his head another direction and repeats the routine. Once he makes his decision, we go where he leads. Sometimes he lets Bridget be the leader, usually on the way home. 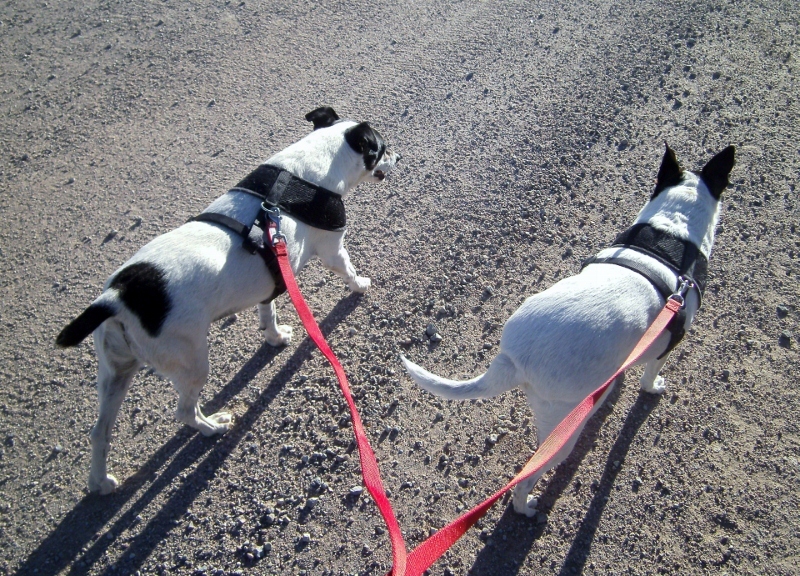 I do keep them both on leash which they actually like. I detect an air of importance in both of them as soon as we set out on a leash-hike. I like to hike in the late afternoon. When we return, the crew takes a long drink and eats supper. Sometimes Rick comes by with Lady and gives Bridget and Spike a chicken jerky treat. I put the new chairs in the PTV for the night. That signals the crew to come inside and crash on the bed. They’re sleeping by my side as I type this. I can hear their breathing so I know their sleep is deep and trouble-free. Sometimes Spike whimpers in his sleep, but never when he’s sleeping like this. They’re both “plum wore out” in a good way. The nights are extremely windy lately. Boy, the palo verde behind the BLT was howling like a banshee around 2 a.m.! This morning I find a long piece of gnarled wood with sufficient weight to keep one end of the patio mat in place. As I sit looking at its interesting shape, inspiration comes! I’ll make my little triangular patch of a campsite into a desert garden! It’s littered with sticks, brush, and broken glass. Yet I see the “bones” of a beautiful garden. The ironwood tree has a graceful, bonsai look. The ocotillo is a brilliant green and will change to orange and later sprout blooms. 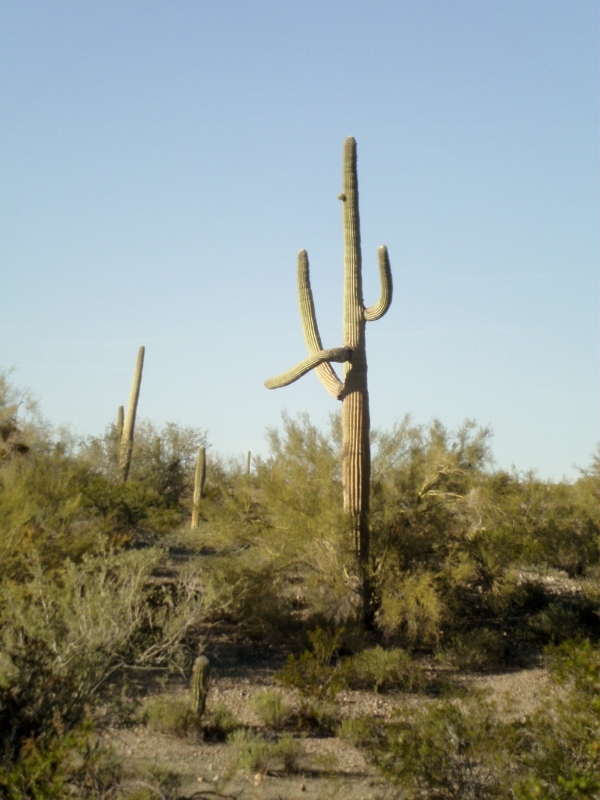 The tall, stately saguaro provides an anchor to the design. Creosote bushes and another bush I haven’t identified yet soften the landscape. I get excited and grab my rake. The clean-up begins! Soon rocks and pebbles outline a path. I rake away a pile of brush, exposing tender green plants that will flower in spring. What fun! The obvious lack of interest by the crew does not dampen my enthusiasm! I go up to Rick’s and excitedly tell him my plan. Hmpfh! You scoff now, but you’ll see! This entry was posted in Simple living and tagged Arizona, boondocking, Darby Wells, desert, dogs, fulltiming, gardening, hiking, Sonoran. Bookmark the permalink. how much weight have you lost going on all thoses long walks? Are you kidding me? Lose weight? It’ll never happen! You might have inspired me to spend some of next winter in cold weather out there in the Sonoran desert. It certainly sounds great with your style of writing. I am personally glad you are writing a blog. Thank you. Such a nice compliment. The desert doesn’t need me to convince people to come here . . . All it takes is a visit and you’ll love it! Pretty soon you’ll be on the road again . . . See, I DO read your blog. Looking forward to reading about your adventures wherever you may go. Gr8 review Sue & crew…enjoy the Ocotillo. Its my personal favorite, especially in bloom. Thanks, Candace. Ocotillo is an interesting plant. I’ve never seen it bloom, would love to. Sue since you have to go dump every 10-12 days, (how far and time) why not get one of those portable tanks, would give you a few more days. Possibly some service stations have free dumping with a fuel fill-up. with portable tank you wouldn’t have to break camp every time. I don’t know about those portable tanks. The very idea of it is kinda yucky. I’ll have to get fed up with breaking camp first. At this point, it doesn’t bother me. Love it, Love it….The Arizona Gardening Lady…. The desert will look even more beautiful when you are done. Will you be at that spot when all the stuff starts blooming or are you making it nice for the next rvers? I think it is a great idea…you may start a trend and other rvers might start doing the same. You’d be surprised how much glass there is in the desert. It goes back years! It’s everywhere. Once I started clearing it out, I had to get creative with it. I uncovered so many potential flowers. I would like to see them bloom. I asked Rick if there’s a period of time when the flowers are blooming and the snakes are still sleeping. He laughed. So I don’t know how long I’ll stay here. surely are enjoying yourself away off out there in the ‘boonies’!!! Didn’t like the ‘crowded’ conditions at Q did you?? Don’t think I would either… Just try getting the OFM out there; heck BB barely got him to Hatch!!! I think the orange/gold stuff IS ocotillo ‘blooming’!!!! Hope your days are going great!!! Oh, Butterbean. You’ve got me all figured out. I do like peace and quiet. No, no, no . . . I think Ocotillo get blooms. The orange/gold are the leaves. Gee, I hope it gets flowers. I’m looking forward to that. Hope you’re doing great and keeping warm. The little triangle patch of earth that is my campsite is going to be a botanical garden! How’s that for optimism? If and when you can, you should see Joshua Tree. I mean if you haven’t already. You’re right, Steve. I should go there and hope I do. Ok, that’s weird. When I typed that, there was more to it than what I’m seeing here now. Here’s kind of what I said in addition to my original post. If you love the landscapes you’re seeing there (which I loved as well) you should check out the deserts in California. Scotty’s castle is a great attraction man-made attraction in the Mojave desert, but the desert itself is just breathtaking …. And then came the part about Joshua Tree. will love the summer heat too. After hearing Rick describe his experience one summer when he stayed and experienced the heat, I doubt I could or would stay. He said the stones get so hot the dogs burn their pads. It’s the pretty rug, Sue, that makes the place. The crew look so comfortable lying in the shade. It’s wonderful that you are making the place nicer just by staying there. It won’t be nearly as nice when summer comes, but I’m sure you have some great plans for the future. Be safe. You know, Pat, I didn’t think about the rug. You’re right. It does give the garden “pop” as the designers say! I love the garden idea, go for it! And when the desert blooms it is wonderful to see. What’s fun is there are tiny little plants appearing where I’ve cleared. I see larger versions of these baby plants when the crew and I go on walks . . .and they have flowers! Wonderin’ how many years back those shards of glass go. Some might be worth saving for a creative project someday. I’m so glad to see you have the dogs on leashes when you’re out for a walk. You probably already know about the Jumping Cholla that almost literally catch on anything if it comes too close. If one of your dogs gets experiences one of their burrs, use two rocks to remove it. The dog’s first instinct will be to bite it off, and you definitely don’t want them to do that! If I weren’t heading for Buckskin Mtn and Quartzsite next weekend, I’d drag my Casita down there to join you for a couple of days. Have a great time in Quartzsite with all the other Casitas. I’m sure you will! Thanks for the warning and info on how to remove cholla . . .hope I never have to. Just recently started reading your blog…..really enjoying it. Just curious if you’ve run across any rattlesnakes while on your walks in the desert? Great name, BTW. No, I haven’t seen any rattlesnakes as they are dormant and in their dens this time of year, so I’m told. Rick is my authority on all things desert as he’s been boondocking here for several winters. He says occasionally, and this is rare, a snake will break hibernation and be seen lying in the sun or looking for something to eat, but they are very sluggish. Soon a BLM ranger will see your “garden”. It’s public land and you should NOT move rocks around. The BLM calls that “landscaping” or “homesteading”. They consider it evidence that a place is getting over-used. Next year, when you come back to that site, there might be a bulldozed berm blocking it off. People need to stop turning unimproved campsites on public land into their own little pretti-poo suburban homesteads. I’m sorry if this sounds harsh. I know you don’t mean any harm. But you will soon learn how dispersed area camping is under attack by Forest Service and the BLM. Unwittingly you are helping their cause. You’ve raised an interesting point. I think I have a solution that will make both of us happy. Since you feel so strongly about this issue and since you are camped just up the road from where I am, why not come down here when I leave and return everything back to how it was before I messed it up? It’s a very small area. Just push the rocks back over the plants and scatter glass and pop-tops around. I’d do it myself but I know I won’t have the heart for it after nurturing these plants.. I know it will take some effort on your part, but I’d appreciate you taking care of it for me and future generations of boondockers. Boy, you really rained on my little parade . . . Funny, I was looking forward to some rain on the plants, not on me! Thank you for mentioning how little things can have a great impact on the desert, I for one, would never have thought of that, though rain on a parade is never fun. That’s the challenge of a garden in the desert, using the tools of nature, such as sybiosis, erosion, and such, to nurture and enhance the environment for plants and desert creatures to thrive and reproduce. What a beautiful desert garden oasis…keep up the good work Sue! Oh BTW…next time you are in Walmart….go to the sporting area and look for some tent spikes, use those to hold down your mat. Although, I love the way your’s look right now! Actually, I have spikes. Now you know how lazy I am. Rather than drive in the spikes and then have to pull them out of this hard ground, it’s easier to put some rocks and a log on it! I’m with BS. Even if you decide not to do it, we will all imagine it in our heads, which is just the way I was picturing that you were. No need to be disappointed–you’ve painted a beautiful picture, as always, Sue, and I’m sure wherever you are (in your mind or within any well-chosen environment), it will be beautiful! Keep up the good work–you bring light to many people’s lives! Yay!!! I was hoping someone would verify that ocotillo have flowers. I want to stay to see the spring here, but I’ve learned not to predict where I’ll be. You like my garden? Thanks! it’s been a while since I have posted but checking on you every chance I can as I have been busy. I love your blog and your pictures and hope in a year or so we will be-able to get down to Az. for a few mounts in the winter. Boonie is right about messing with the natural landscape even tho it looks great, check with the rangers to see what you can do as we don’t want you to be baned from the BLM lands. I’m happy you are enjoying my blog. I never tire of hearing compliments about it! Thank you. I haven’t decided what to do yet about the garden. I’m hoping I can revive my excitement about it, derive pleasure from it, and then destroy it if Boonie won’t do it for me. I am in a quandry, eh? I couldn’t wait to get going on the garden this morning. Now I feel like crap. Oh well, I’ll get over it. I’ll try to get some photos of the desert in bloom. I’d put some on right now but my camera can’t show the beauty of the tiny flowers I’m finding. That sounds like Spike and Bridget! Dogs are great, aren’t they. So many different personalities . . .
Hi Sue, I don’t see that you did overdid the landscaping. I can’t imagine that the BLM folks would EVER be upset at anyone picking up the discarded pop tops and glass since that’s actually litter left by previous campers that don’t love the land. The biggest problem with raking or even footprints is that it disturbs the tiny lichens that actually hold the soil together and prevent wind erosion. Although what you did looks great, it may not be what’s best for the area since the desert doesn’t “bounce back” from change as quickly as areas with high rainfall do. When we were at the Sonoran Desert Museum in Tucson we learned that many of the little plants depend on the brush or other cover to help them get started and keep critters from having them for dinner or wind from blowing them away or drying them out. I was amazed at how complex and fragile the desert ecology was. Not to worry. I covered up the little plants with stones, brush, and broken glass, almost like I found it! Hi Sue and Crew…Sure enjoy reading your Blog and look forward to your new adventures. My wife and I are about 15 years (or more if the economy doesn’t shape up soon) before we can hit the road in our RV. In the meantime, we live vicariously through your Blog and others like The Bayfield Bunch and Tioga George. Keep up the good work of motivating us all to look forward to our futures. Both Boonie and Reine have raised valid points and I’m glad to learn from them but I think I like Reine’s presentation a whole lot better. Hi, Sheila! What can I say . . . This was a very nice post — just the respite I needed. I know what you mean: to, as they say “let sleeping dogs lie.” A sound of domestic bliss for me is my snoring dog, passed out, in deep sleep after a nice run. I sometimes think I can actually “hear” the contentment in his snores. It’s music to the ears, isn’t it. To hear someone you love sleeping without fear or worry! who knew? I was so enjoying reading of your joy in creating your little oasis when then Boonie got me all worried about the desert… hmmm….. and got me visuallizing you being carted of to jail for destroying public property while the crew was placed in foster care, then a law being passed, which they would name after you, forever forbiding anyone to camp on BLM land. Totally blew the peaceful moment my head was wrapped around just before reading his comments. Seriously though, I guess he raises some valid points. Bummer, because I really wanted to see your finished masterpiece. As I read your posts (you know I have been here a while, though I only write something from time to time) what strikes me in your beautifully phrased story telling is the overall feeling of peace, contentment, and a pace which soothes the soul. I wanna grow up to be just like you. The funny thing is . . . this worry about the desert centers on a tiny triangle that is tamped down ugly on all sides by motorhome, truck, trailer,bicycle, ATV, and foot traffic. The bushes are misshapen and struggling under piles of brush thrown there by humans.. . and then there are broken bottles, pop-tops, razor sharp rusty cans . . . Where’s the outcry? This has been a learning experience. Unfortunately it’s a lesson I’ve been taught many times before. In order to have an overall feeling of “peace, contentment,, and a pace that soothes the soul” one has to find a way to live one’s life without attracting the criticism of people. I lost that feeling yesterday as I was kicking stones, sticks, and trash around the garden, returning it to its “natural” state. Thanks for opening a door for me to let out my feelings, Carol. Bless you for your kind words. You’ve helped bring me back to myself. Sue I am so glad I could give a little something back for all you give the rest of us by sharing your adventures big and small. By the by, I am thinking that Mr. Spike is not a good barometer of when it is safe to go back in the water.. or whatever…He’s a pretty good barometer of when it is time to take a nap… I am still extolling the virtues of my watchdog chihuahuas.Those aliens in the sky would never stand a chance against a couple of ankle biting chihuahuas, and remember, they don’t take up the whole bed like some rat terriers we know who shall remain nameless. Hey Sue, it’s coyote mating season . . . . Ack!!! Never in a million years would I do that. First thing you know, there’d be bickering about where to plant a petunia. I don’t miss my yard. I just have a tendency to want to leave places better than I found them. Sometimes you can’t follow that urge. I hope you are having a good day, we all know from reading your blog how much you love the desert.I’m hoping that all the chatter about your little garden oasis won’t stop you from doing your blog and bringing all the great stories and pictures. Life is all about learning and some people need to remember to be nice. Keep up the good work. Love those dogs. Thanks for the encouragement. I’ll keep writing for people like you. Hey Sue…I like your lil charcoal grill…care to say where you bought it in Q? I’m looking for a replacement for our old one. Thanks! Interestingly, the grill is the same as Chuck and Geri’s. Geri told me she got hers at Walmart and other people have wanted one like it, but she’s never seen one again at a Walmart since she bought hers. Well, we go to Walmart together in Yuma and there it is! (The grate that holds the food is not shown in the photos.) It folds up like a metal attache case. You could probably find it at Walmart online and order it shipped to your closest Walmart. It would be nice if the people who trash the desert would be held accountable for their actions. I can’t believe that cleaning up your little space is going to upset the eco system of the Sonoran Desert. I am sure that within 2 weeks, if not less, of the time you leave, that place will look like you were never there. The trashers will be back. Thanks Gail. I am sure that no one was trying to intentionally hurt my sister’s feeling and I am sure Susan doesn’t want her blog to turn into a contentious spot. I can see that all the “friendly advice” is correct on a large scale, or if thousands of people decided to follow Susan’s actions en masse. However, to clean up a postage stamp size area around your own little camp site can not be construed as a threat. Susan is enjoying her new found freedom and life and is giving all of us some enjoyment through her blogs. I know that we cheer her on when things are good and cry with her with things don’t go so well. I cried when she destroyed her little space. To Susan: Do you remember when you didn’t have a cover for your science book? My feelings today are almost equal to that episode in our lives. Love you!!!!!! Oh, Pauline. You’re so sweet. I’m sorry this made you sad. After a day of sunshine and cleaning my trailer, I’m over it. Next time I hitch up to dump tanks and get water, I’ll probably find another campsite and forget all about this. You always were willing to come to my defense or to help me over life’s rough spots. This garden fiasco is nothing compared to the heartaches life can bring. I’m grateful for a big sister like you. Love you, too! Thank you, Gail. Wow, quite nice compliments! Aunt Susan this is Tawnya, you clean up what you want. You are not hurting a darn thing. any idiot that thinks picking up garbage will harm anything need the letters on his keyboard plucked off. i got your back. continue on ! i love you. Tawnya! You are too much! I LOVE YOU! Your comment gave me my biggest smile of the day. . . . I’m laughing out loud. Man, nobody better mess with me. All I gotta do is give Tawnya the word. She’ll pluck more than the letters off your keyboard if you don’t watch out! You got that right, Gail. Tawnya is tops. Hi Sue- I figured I could sign-in somewhat inconspiciously after 64 responses to your current blog. I see you have a testy side responding to ‘Boonie’. That’s cool! But he (I guess it’s a he) has a point. Well-meaning talented artistic humans motivated to add non-vulgar improvements to public lands are not in short supply; they get ‘outed’ (new polictical term) for their……are you ready for this….their individuality! If you had gathered signitures and held group seminars, you might have found out, that, while you went about IT the right way, the answer is NO! Reckless acts of kindness or beauty are not what they use to be. K turned 61 the 17th, greeted by a surprise gathering in Mesilla Park, NM and I picked up parts for a solar project in Chandler, AZ. We’ve landed back at EBLSP to 70 degree weather. Will be in touch soon. So good to hear from you, Bill! Belated birthday greetings to Kathy! So the solar project is making progress . . . that’s great. Thanks, BTW, for the care package you sent via Chuck and Geri. I was remiss in not getting in touch right away. So the Butte weather is back to normal, no more freaky snowstorms, I hope! Keep in touch,, stay well, carry on . . .